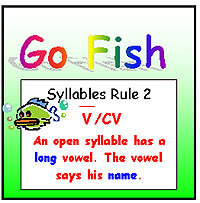 Go Fish - a printable phonics game for learning about syllables in reading or spelling - Feel free to print it out. Go on! Give me a hand to keep these resources free to those who REALLY need them! Here is a great example of what people can achieve using the relatively simple technology of the Internet. Billy Reid is a reading tutor in Northern Ireland and is using the games offered below with his students to great effect. He has emailed them to me and I've added them to my site for you to download. Thanks a for the superb work 'SUPERBILL' ! 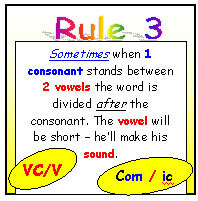 NB The rules to these gamse are given in the printed version. Don't miss my next game - subscribe to my newsletter to find out when it's ready.